Every now and then a day of fishing comes along that is as hard to believe when it’s happening as when its over and just a memory. Today was one of them. 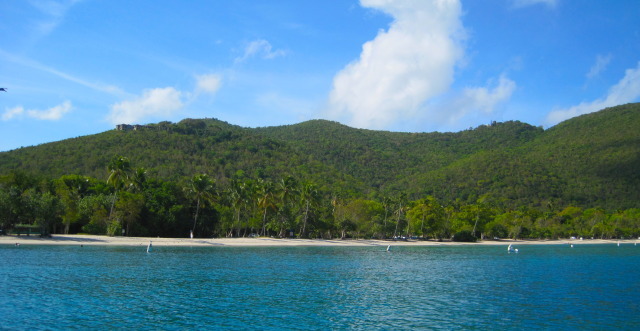 In December my wife and I decided to come to St Thomas and spend a week relaxing and seeking out deserted beaches here in the Southern Caribbean. As soon as plans were firm I started planning to fish at least one of the days. Much of what I read online was discouraging. 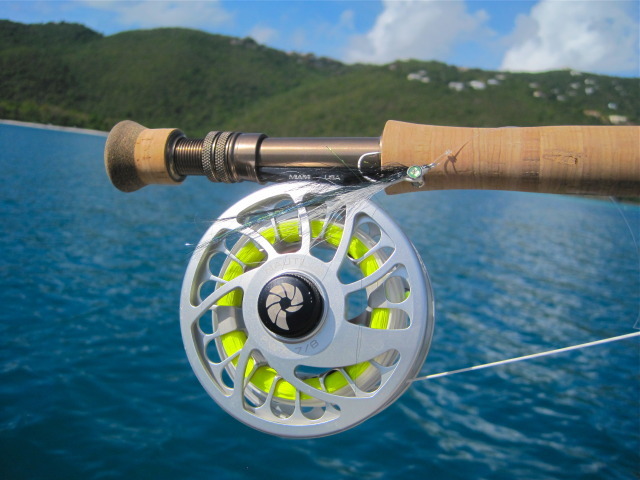 Talking about how St Thomas was not the place for in-shore fishing, but thats really what I wanted to do. Then I found Captain Rick who runs Swashbucklin’ Tours. His reviews online were awesome and he seemed like a genuine guy on the phone. A day was booked and the anticipation started to build. Today was the day. I woke up early and made the drive to the other side of the island at our pre determined time. Capt. Rick rolled up to the sand and jumped out of his boat to greet me. I’ve fished with enough guides to know that Rick is a rare breed. No pompous attitude, no belittling comments, just an encouraging good boat captain who really loves to fish. As we left the ramp I assembled my 8wt and picked out a likely fly. Rick showed me some lures that usually work and I did my best to match them with a clouser minnow from the box. 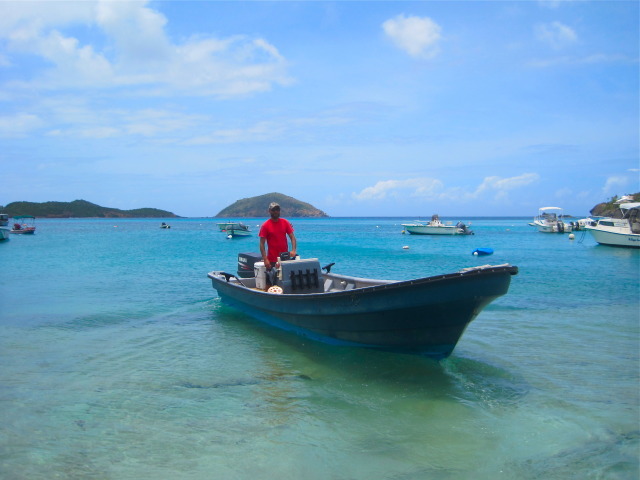 We slowly motored into world famous Magens Bay and made small talk about growing up in Utah chasing big game around the state. 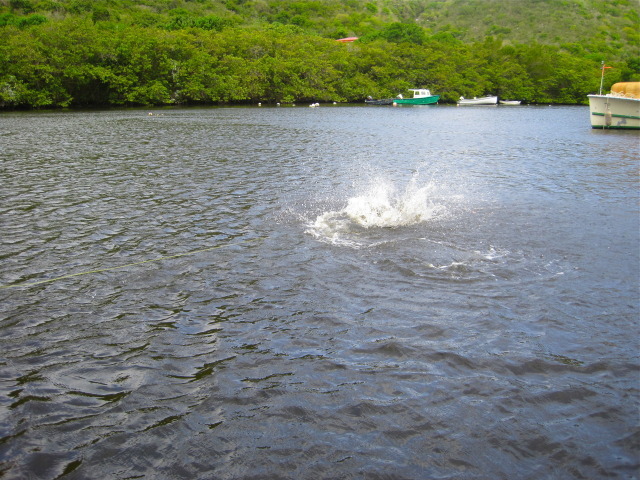 Before long we found ourselves surrounded by Terns and Pelicans diving on bait fish as Bonito pushed them up from below. We trolled though the school and hooked up with a little guy that burned drag from the reel but came off right at the boat. 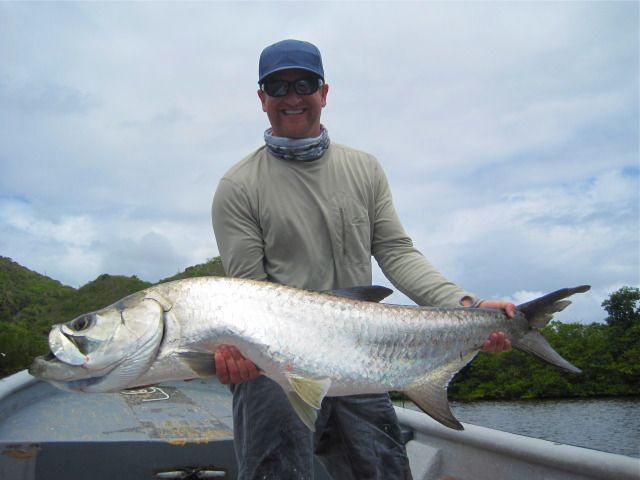 Seeing no Tarpon, Capt Rick decided to take me to an area thats more suited for them. 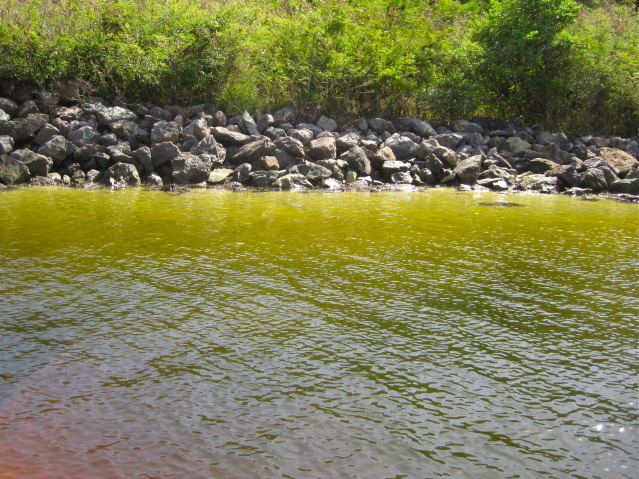 As we coasted into the bay with the motor shut off I spotted two BIG Tarpon chasing bait over this sandy bottom. I made a cast, striped the fly back methodically and the big fish turned on it, then turned back away. I picked up and threw back to him. He turned, followed, grabbed the fly and was in the air all within two seconds. Showing my rookie excitement I heaved upward with all my might and the fly flew out of the fishes mouth. Rick kindly reminded me that I need to wait for the fish to turn and then when he jumps, bow to the “silver king”. I just stood there, shaking uncontrollably. Two casts, and a 50 something pound fish was on and off. 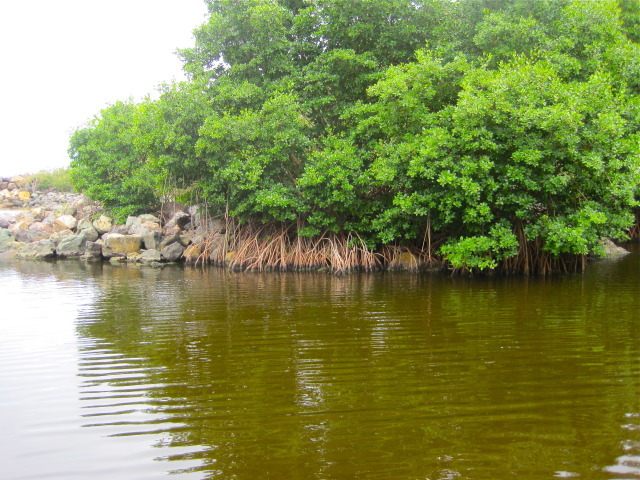 We motored further into the cove passing mangrove covered shorelines that looked super fishy. The bay opened up and things started to materialize. Pelicans dotted the bay, a couple of boats were moored to buoys, nervous bait swam skyward and into the air away from some un-seen predator below. Then we saw them. 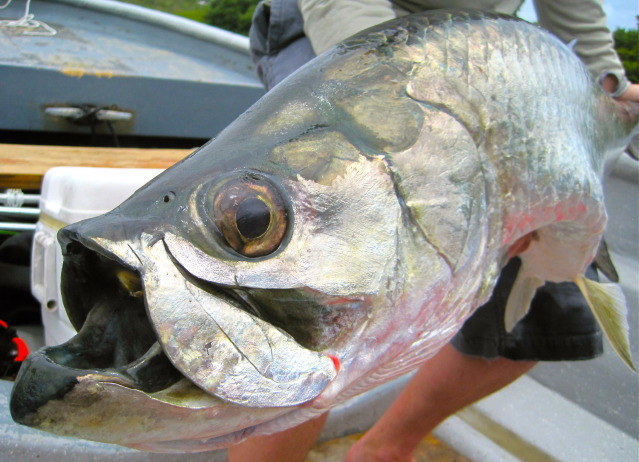 First one, then another, and another… Tarpon rolling in the dark water. I was going to get another chance. 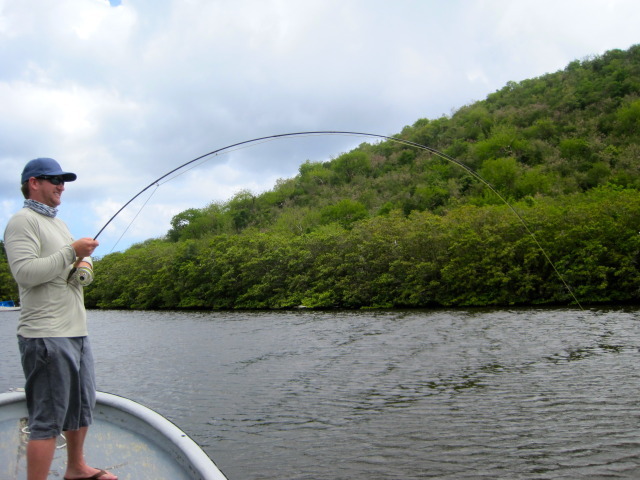 After several casts to fish well within range I saw a huge silver flash and felt weight on the other end of the rod. Nerves got me again! I whiffed on another one and sent the fly soaring over my head. More reminders from Rick on patience. I was determined to do it right if I got another shot. Tarpon continued to roll on the surface. A fish came up about 60 feet out. I hauled back, waited for the rod to load and then powered it forward with another big haul. The rod shot the line out and landed the fly right where it needed to be. Rick announced that it was a good cast and I stripped line back hoping for the best. Three strips in and the fish ate. I held my ground and did not lift the rod. The rod loaded up and out of the water leapt the silver beast. There is really no way to describe it. All that comes to mind is hooking onto a motorcycle as it zooms by on the road. Pure muscle, mouth wide open, head thrashing violently, trying everything it can to throw the hook…. I bowed. 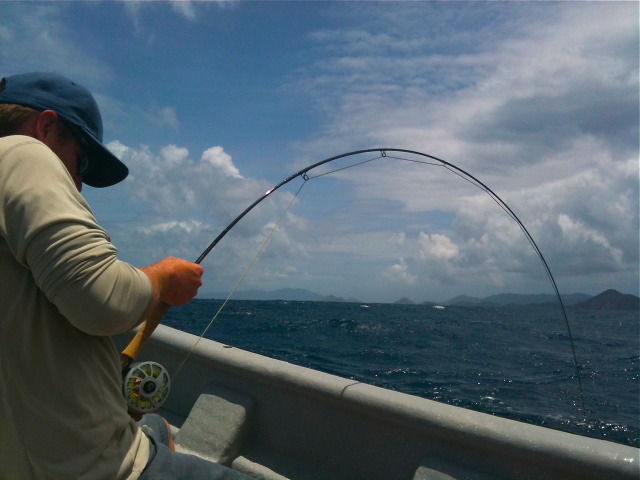 The first thought I had was, “what am I doing, hooking onto a huge fish like this on a silly little fly rod? !” Fifty-five arm aching minutes later we finally got the fish in the boat. Cheers and celebration were probably heard on the other side of the island. 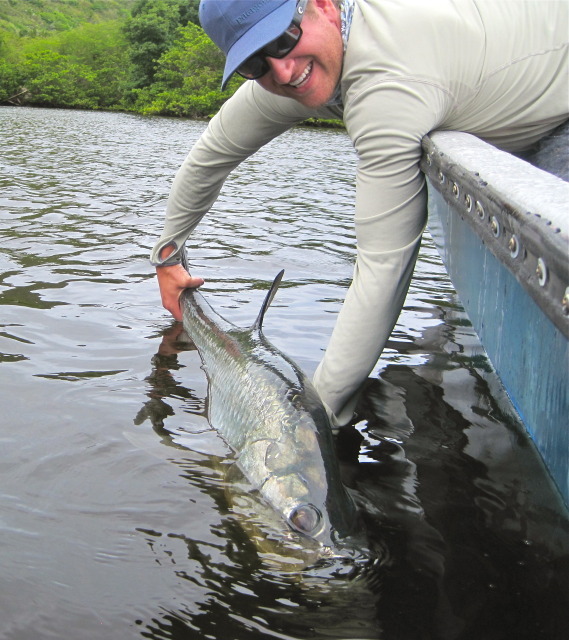 I hooked, played, and landed a Tarpon on the fly on an 8wt Sage ONE! 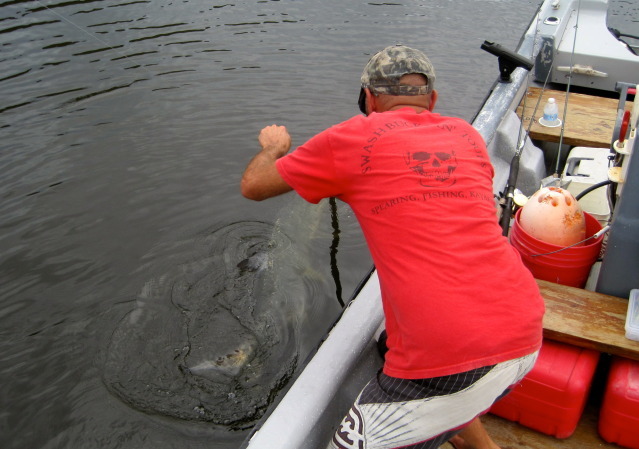 I sat on the front of the boat, my lap covered in Tarpon slime, in utter disbelief. 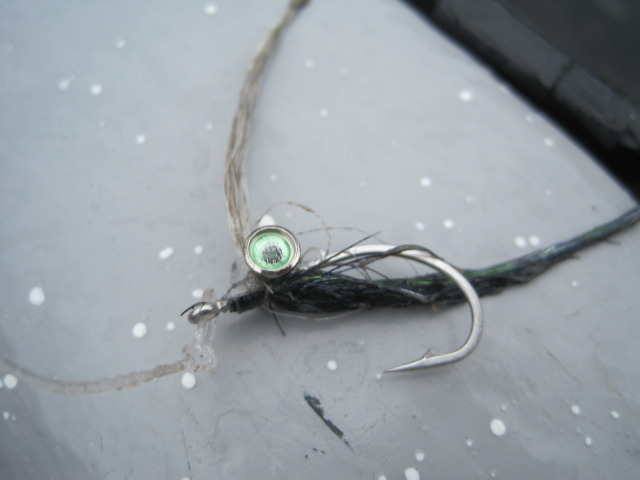 Whem my nerves finally calmed I cut off the fly, tied on another one and we slowly motored out to where the first one was hooked. Two casts in, along the same beach, the water exploded again. This fish, bigger and much hotter than the one we landed, went air-born several times then straight into the backing out to deep water. There was no stopping it, so we pursued. Rick asked, “you got your sea legs on?”. The blue water out of the protected cove was rough but we played the game of inches. For over an hour and almost a mile from where it started. Props to Rick for expert boat handling and to Sage for such a good stick. I had the thing to the cork, with the drag completely cranked on the reel for two hours total today and to my amazement the rod held up. I can’t thank Rick enough for such an amazing day. He listened to a goal in my head and then made it happen. I hope to be back, next time with a 12wt rod. 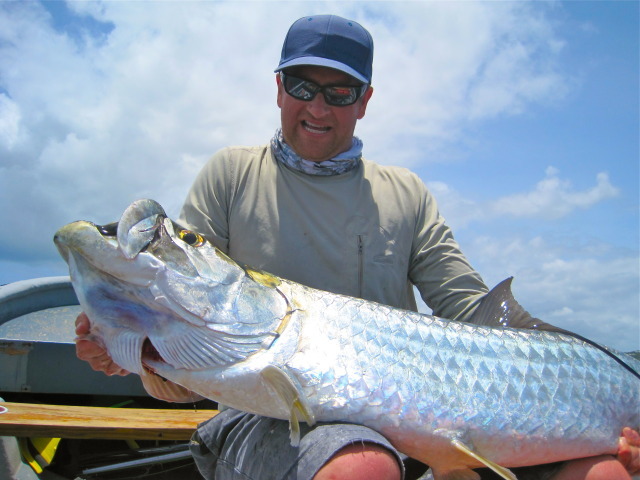 This entry was posted	on Wednesday, May 2nd, 2012 at 4:34 am	and is filed under Fish, Fly Fishing, Ocean, Sleep When Your Dead, St Thomas Tarpon, Tarpon on Fly. You can follow any responses to this entry through the RSS 2.0 feed. You can leave a response, or trackback from your own site. You are my hero! Good stuff man, the pictures I bet don’t do it justice, but i’m absolutely positive it was epic. I had a grin on my face the whole time while reading this man! WOW…..
OK, I forgive you for the teaser. That was FREAKING AWESOME!!! I would have wet myself with excitement. Thanks for the share! This is your year dude! That 8 wt was bent to the freaking cork! Dang. That looks like fun. You are the man! Nice report everet oops I mean Kyle..
Amazing day man. Dang that looks like a blast. A day you will hopefully never forget. Super sick story and write up man. congrats! Unreal. Two incredible fish, especially on an 8 wt! That just isn’t supposed to happen. Congrats and thanks for sharing. Wow, incredible story Kyle! Great pictures, makin’ your Dad proud for sure! Glad we bought you that little fishing pole when you were five and took you to Vivian you know! Thanks everyone! Something i’ll soon not forget. 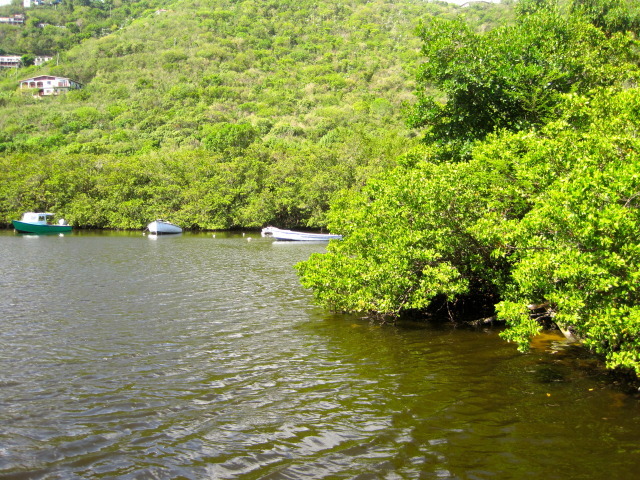 I fished some flats on St John yesterday but we have had some serious rain and the fishing was not great. So much fun though! That was an awesome report Kyle. I have been there before, but never thought to fish… You’re the man! Wow!! Awesome pictures and experience!! Loved this post and really loved your writing and the pictures. Nice Fish! I’ve tried that cove out myself. Amazing place to fish!